The legal profession was slow to accept women, and the percentage of women in law firm leadership positions remains low. Similarly, the tech space has been slow to accept women, perhaps stemming from historical issues of girls being discouraged to study the sciences. But where there’s an artificial obstacle, there’s a woman on the job to shatter it. Enter Kristen Sonday. Furthermore, because women are disproportionately affected by access to justice and workplace issues, they are also uniquely positioned to solve them. Take, for example, Montage Legal and MyVirtual.Lawyer. “Montage Legal was founded by two women (Erin Giglia and Laurie Gormican) who brought their own experiences as mothers,” says Heidi Alexander, the Deputy Director of Lawyers Concerned for Lawyers – Massachusetts and the head of the ABA’s Legal Technology Resource Center Women in Legal Tech awards. “Montage Legal provides freelance lawyer services by mothers at home on an hourly basis to provide flexibility. Another is Brooke Moore of MyVirtual.Lawyer, who has a network of lawyers, including a focus on military spouses who oftentimes have difficulties getting hired due to transitions in their husbands’ locations. Make an introduction. Even just one introduction to a potential buyer or investor can have an incredible impact on a female founder’s business. Women-run businesses are the real deal. Women bring thought and depth to their companies, often addressing issues that have been previously ignored. 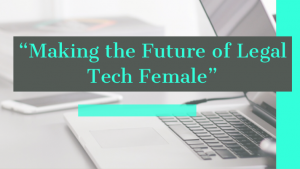 While Montage is not a legal tech company, we are female founders of a company that supports new ways to practice law, and are incredibly supportive of all female founders, especially those in the legal tech space. Congrats to Kristen and Felicity on their success with Paladin, and to all the women founders of legal tech companies! To support these women’s companies, check out this list.